Bill Kopp’s Reinventing Pink Floyd mines the rich history of one of the world most popular bands during one of that band’s most trying times. Before hitting it huge with their 1973, The Dark Side Of The Moon album, ‘The Floyd’ were undergoing a great crisis of songwriting and identity, extricating itself from the influence of their founder/leader, Syd Barrett. As infamous these days for his bout with madness and then reclusiveness post his Floyd years, a cult has grown up around Barrett, with many people divided, as Kopp makes clear, over what version of the band they like best, pre or post Barrett. As researched by Kopp, the band worked out new music in their live concerts, at the famous Abbey Road studios (and others), worked on soundtracks and released a bunch of music-all that Kopp truly gets to the heart of-through growing pains few bands experienced at the time. What works best for me is the hearty section on live Pink Floyd concerts just pre-Dark Side, as the band shaped what would become their (arguably) masterpiece into suitable shape for recording. I have no idea where he unearthed the eye (or is that ear?) witness accounts from these concerts at the start of the 70’s and how he managed to listen to these particular bootleg tapes. But reading Reinventing Pink Floyd one has to be happy Kopp did his research. Lots of books have brought Pink Floyd’s story to light, but few do it as well, and focus so perfectly on such an important time in the band’s life, as Reinventing Pink Floyd. 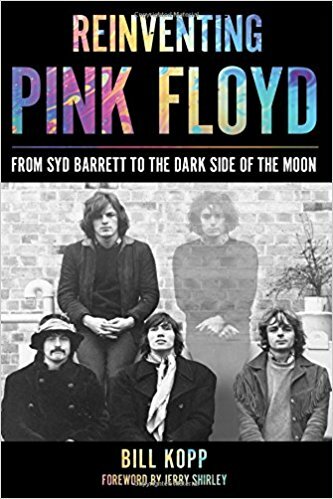 Even for a staunch old Pink Floyd fan like me, this book was full of surprises…and made me appreciate one of my all time favorite bands all that much more.